The many friends of Frank Crist were shocked Monday to hear of his death, which occurred at his home 713 E. Cedar street, at 11:30 Sunday evening. He is the son of Rev. H. F. Crist and Olathe and vicinity has been his home for many years. Typhoid pneumonia was the cause of his early death, at the age of twenty-four years. For about five years Mr. Crist has held the position as baggage roaster for the Santa Fe and the beautiful fforal wreath bearing the Santa Fe emblem given by those employed with him will attest the high esteem in which he was held by them. He leaves a wife, formerly Miss Pearl Brunk, and a baby, his father, Rev. H. F. Crist, three brothers. Ernest and Ralph of Olathe and Harvey of Paola, and three sisters, Mrs. Brammel of Paola, Mrs. Carter of Washington, and Mrs. Alva Myers of Colorado. The funeral services were conducted from the church of the Brethren at two o'clock Wednesday. July 7th. Rev. R. F. McCune of Princeton, Kans., officiating and burial was made in the Olathe cemetery. The following out of town relatives attended the funeral: Mrs. John Morgan, sister of Mrs. Crist, from Osage Countv; Mrs. Ida Henry, sister of Mrs. Crist, from Independence. Mo. ; Mr. and Mrs. Ben Brunk, brother of Mrs. Crist, from Lincoln. Nebr. : Mr. and Mr.s Geo. Carter, sister of Mr. Crist, from Washington; Mr. and Mrs. Levi Garst, relatives of Mr. Crist, from Gardner; Mr. nad Mrs. John Brammel. 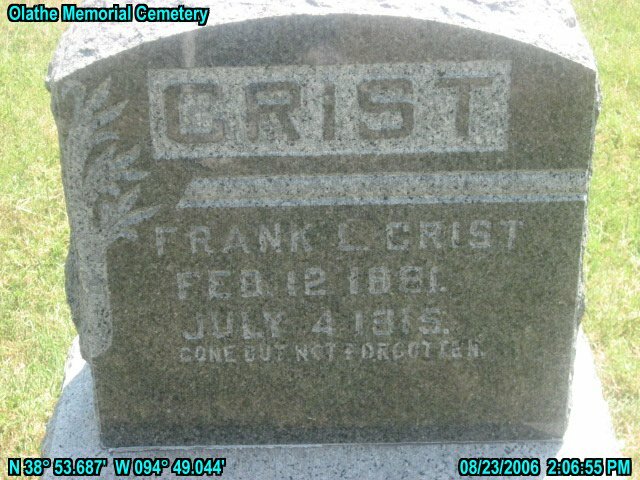 sister of Mr. Crist, from Paola and Harvev Crist, brother of Mr. Crist, from Paola; Wm. McClure and wife of Overland Park; an aunt, Mrs. Filburn and son, Clarence Fil-burn: Luther McKaig and family of Gnrdner: I. H. Crist, an uncle and wife of Kansas City: Mrs. Ella Harmond, a friend of Mrs. Crist, from Kansas City; Mrs. James Donlon a cousin, and uncle, C. A. Morgan of Ottawa and a number of other distant relatives and friends. Please share your memories of Frank Lyman.